I have had the pleasure of working with an Algebra 2 teacher this year at Crowley ISD in Texas. She applied for a Dell Certified Eductor program in her district and attended my two-day kick-off last fall. She admitted that she signed up because she was positive that technology integration would not work in math. Some of you may be thinking that’s the opposite response you would’ve expected, and I’d have to agree. I love her thought process, however, in this situation. What I love even more is that once she put her mind to accomplishing the goal of effectively integrating technology into her high school math classes, she was all in. After that initial two-day workshop, I got to lead Mrs. E through three job-embedded coaching cycles. We used the Teaching Innovation Progression Chart developed at Henrico County Public Schools sevenish years ago as the guiding document and measuring tool throughout the process. Today was my last round in Mrs. E’s classroom for this school year and to say I was delighted would be an understatement. Right after Christmas break, she established three learning spaces in her classroom: Independent Station, Semi-Independent, and Teacher-directed. She started putting the class notes and other information in the LMS the night before. When students came in the next day, they could sit in the Independent Station and start to apply the knowledge on the class assignment. 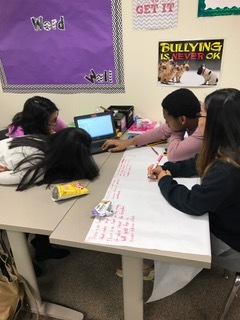 They could sit with a group of classmates at the Semi-Independent area if they wanted to discuss the content and work on the assignment collaboratively. Or they could choose to join the teacher for a more traditional teacher-directed lesson. She frequently checks in with her students to see how they are doing with the changes she’s made. She recently asked a student why she always came to the Teacher-Directed group for the lesson instead of the Independent group. The student’s response was, “I don’t learn like that.” I wasn’t surprised by this response, but it saddens me all the same. Because everyone learns “like that” – by doing. It’s inherent. We are born with the capacity to learn by doing: rolling over, sitting up, walking, eating independently, etc. We didn’t learn to do any of those things by listening to someone tell us how to do it. But somewhere along this student’s school life, she forgot how to drive her own learning, and got used to the sit-and-get method. Fortunately, she has a teacher who is willing and eager to scaffold real learning experiences back into her life. Today, Mrs. E introduced cube roots like this, “Today you’re going to learn about cube roots. But I’m not going to tell you anything about cube roots. [pausing for effect] Where do you go when you don’t know how to do something in math?” The students answered with Google, Khan Academy, and YouTube. Mrs. E added Purple Math, while I added Wolfram Alpha, and they had a list of places to begin. Prior to that, as they entered the class they chose a seat at a table for four. Then, after groups were assembled, they chose a role (Time Keeper, Computer Person, Scribe, Reporter). 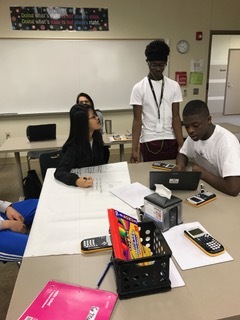 Mrs. E also had an assignment in Desmos to guide their research, and they were off to drive their learning, collaborating with peers, for the next 45 minutes. The Scribe recorded what they learned on chart paper and then the Reporter shared the group’s learning with the rest of the class. Mrs. E had this part of the lesson added so that she could supplement any information that they might not have found. The best part of that? She didn’t have to supplement at all! The kids found all of the information regarding cube roots that she had wanted them to. Out of the hour+ class period, I only observed one student out of 24 being off-task. They were engaged and working well together. In the last five minutes, she took a quick poll from the class on how they liked today’s class. It was overwhelmingly positive. I guess they do learn “like that” after all. I can’t wait to hear how the rest of the school year develops in this Algebra 2 class. Well done, Mrs. E! This entry was posted in Education, Professional Experiences, student-driven learning, Technology and tagged algebra, Desmos, edtech, education, math, student-driven learning, teaching. Bookmark the permalink. I wish my algebra teachers back in the 1980s had tried something different. I never understood a darn thing in those classes. I managed to pass because I followed the steps and memorized the formulas, but I understood nothing.